This French K-Drama website 'Stellar Sisters' (which previously wrote good review of '30 but 17' and 'Hymn of Death') gave our SHS 'Best actress in the leading role of year 2018' . No one else deserved more than her . (google translation is okay for this site). An actress distinguished herself this year: Shin Hye Sun. It began the year 2018 very strongly with the last months of broadcast of My Golden Life , which achieved impressive audience scores and launched its career. In Thirty But Seventeen , she is not only touching and funny, but brilliantly meets a real challenge of actress. She also marked the spirits in the purely dramatic register in Hymn of Death. 2018 was the year Shin Hye Sun! Enjoy your weekend everyone !! This is precious!! Thank you @immorethant ! Just want this at top of page so we can show off some more our muse! And now add one oldie but prettie I haven't seen us post here. This post is dedicated for old video clips. Found videos that our Shin Hye Sun did fashion photo-shoot for Cosmopolitan and 1st Look in Apr May 2018 (refer to @meechuttso's post on page 69 and 70). I think I have seen 2 clips of this CF before, but not this one. But you all may have seen it already. SHS's short appearance with 'Oh My Ghost' team from this live video of Park Bo-Young. Some not-quite-old video, but worth to mention. '30 but 17' drama fashion. (This is from EP16 , you can find more videos of other EPs from the same channel). You may have seen this 'Olive Young' CF already, but this clip has English Sub, yeah !! So today it’s exactly one month since HS posted on IG. I wish her to be more active. Maybe she should think about doing VLive ... would be fun with her. More baseball gifs and high quality video !! I want to take a moment to Thank @immorethant and holler one more time for her just Krrrazy prodigious output lately. First the collage of SHS hairs, two of them becoz there are so many. Then her thoughtful baseball gifs presents to us all - so gorgeous, and the best ever created in the history of baseball gifs. You should do more embeds of gifs in text frames I say. And then this last flood of oldie clips, many of which even I haven't seen. In all of the gifs and vid clips, there occurs a continuing theme of Shin Hye-Sun's bowing (now countless) and being Miss 'polite'. Thanks to @immorethant's fabulous and timeless artwork, I am now inspired to dub Shin Hye-Sun, the Polite-tician doing her Polite-tition (repetitive bowing). Thank you @meechuttso because sometime when I checked my SHS Youtube playlist which I gathered, I found some videos were recently deleted or blocked or url changed which made me sad that I might not see those again . So personally I think I should dig those precious old videos (and download) as much as I can now before they will disappear forever , so that I can move on to her next drama and movie without regret. For baseball video, apart from that Facebook link , I also found Youtube link but it was blocked for viewer outside Korea (not sure if it's the same for all of you). So you may need Korea VPN to watch this. Have a happy Sunday everyone !! Watching these gifs always makes me smile the whole day. So funny and cute our Shin Hye Sun. @immorethant I need to update my front page with some or all or your gifs. SHS thread has entered a new age! Speechless. Stupendous. Astounding. But she needs to be active though! Can someone message her this thread on IG to let her know how bored her fans are? 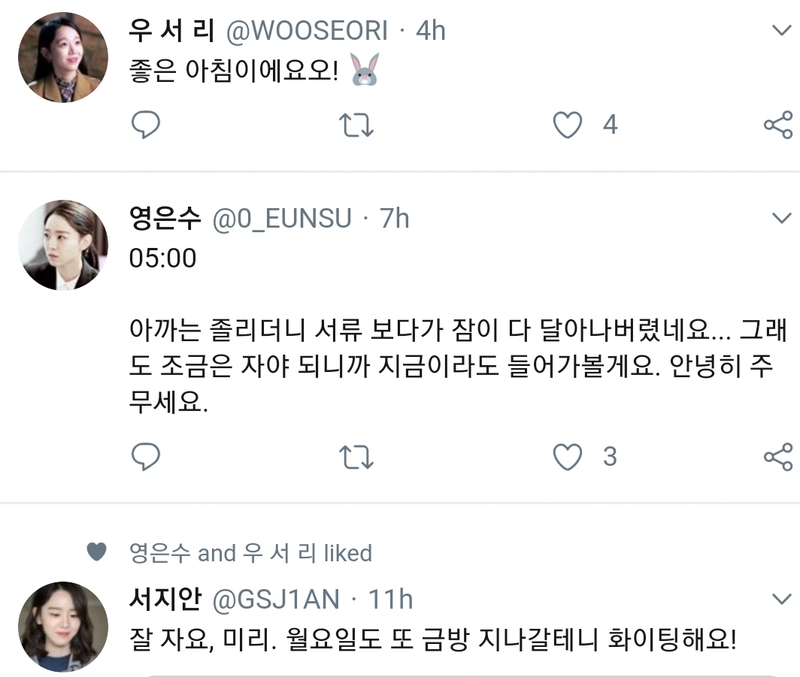 Although there is no update from Hye-Sun, now you can follow Seo-Ri , Eun-Soo and Ji-An's twitter. Sometime they talked to each other. @immorethant I would but I wouldn’t know what they are saying without subs. I was wondering ... since came across this habit ... if SHS’s thumb was anywhere near her lips in Still 17 as well. Well, she didn’t disappoint! So what time will probably hear something about the event? I hope it wasn’t a mistake on the article. BTW, am I reading her wrong? Was watching couple of her airport sightings ... it seems like she even loves interacting with paparazzi. They literally had to drag her away!! 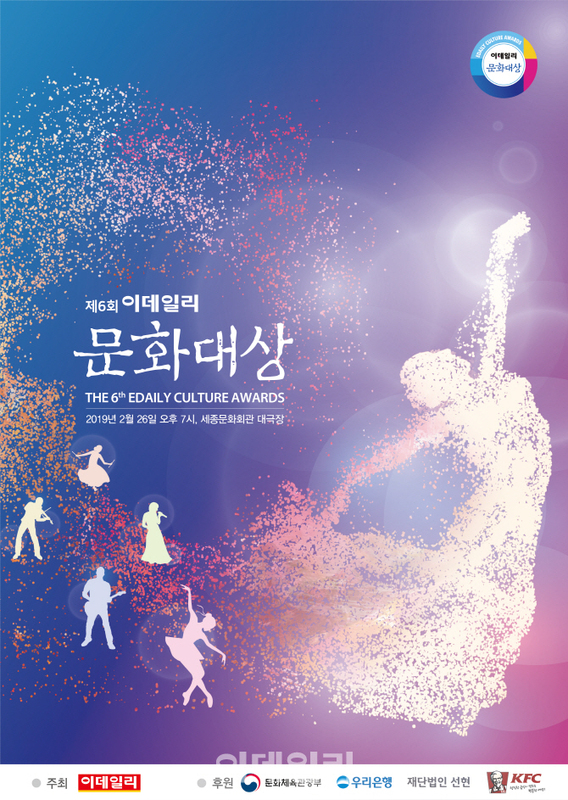 The 6th Annual E-daily Culture Awards ceremony and the Gala Concert will be held at 7 pm (KST) at the Sejong Center for the Performing Arts in Sejong, Seoul, Jongno-gu, Seoul, . The red carpet event will be held at 6 pm in advance of the event. The red carpet event and the event will be broadcast live via Naver V live. Ha ha...me too, I can only translate 20% of the message. And sometimes even using 'translate tweet' doesn't help either. I just follow those twitters to see the pics and gifs. I think because she's so humble, she might never see herself as a star and didn't expected that many photographers/reporters would show up like this at the airport. This might make other people annoyed, but instead she might feel grateful to get this much attention so she behaved as herself (shy, polite and cheerful) which is very charming. @immorethant She is funny in a cute way! Ah that’s like almost 4 in the morning my time! I have to figure out if I want to stay awake or not! There better be lots of pics! Missing her face. Btw, I have a question ... I always wondered ... not only just with her name but those who have “Hye” as well. Is it Hye Sun or Hae Sun? What is the difference between Hye and Hae? lol! @immorethant can we assume that every time she was walking thru the airport she was dreaming of doing a blind person's role? From March 2018 airport clip and the LA trip one right after 30b17, we might be getting a glimpse of what she might look like in Dan Only Love - will she sport a cane as a blind former ballerina, or not?? Go to bed early, @jakey09 , like right now, and rise early. Her name is spelled 신혜선. 혜 is pronounced like, 'Heh, Heh, Heh' (laugh). Note : from her Chinese alphabet name (hanja) 申惠善 , the word 惠 (hye) means favor or benefit. There're also 16 'hye' alphabets [ https://en.wikipedia.org/wiki/Hye_(Korean_name) ] which I think most of their meanings also match her (憓 love, 慧 intelligent, 蕙 orchid, 暳 twinkling stars, 䚷 honest, sincere, joke, fun). Oh, no...director-nim, please don't make her close her eyes or wearing sunglasses in 'One and Only Love'. Because her eyes can talk and they're so good at expressing emotion. Anyway, I love her short hair and her clothes in this Mar18 airport clip, approved for Yeon-Seo to dress like this. @meechuttso Lately, I’m going off to bed at 4AM anyway. That’s cause I hit the gym late. So, it’s ok. Will be awake! I’m a sleeper ... even if I go to bed early I won’t wake up! It’s funny cause most of the times media uses Shin Hye Sun. If HS didn’t know better, media should have used it right? Also, the reason I got confused cause in promotional Photoshoot of hers, I observed media outlets tend to write “Shin Hae Sun” but on the web ... soompi, AsianWiki, wiki, etc they all have it as “Shin Hye Sun” ... So when people write about her online and will with time as her popularity rises ... it will be “Shin Hye Sun”. Don’t you think it will be hard to get the promotion right if there are two different names? I personally prefere “Shin Hae Sun” because I noticed every time you search on Google her name tends to get mixed up with “Park Shin Hye”. It’s all about hashtagging ... Don’t know what to go with? Shouldn’t (the company, fans) take responsibility to get it right? @meechuttso Her company listed her as “Shin Hae Sun” as well. Shouldn’t edit the name on this thread as well then? There will also be live on this e-daily channel. Apparently, Dan My Only Love has just started filming. Only thing is not sure if it's only others starting ahead of Hyesun. This guy should be one of the supporting cast. My love is fashionably late or not walking the red carpet!